327 in stock Need More ? 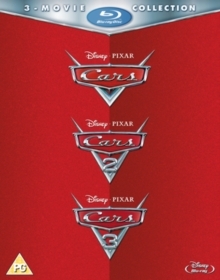 Triple bill of Pixar animated comedies following a group of talking automobiles. In 'Cars' (2006) successful rookie racer Lightning McQueen (voice of Owen Wilson) crashes through Radiator Springs while travelling to compete in a big race and is forced to remain in town until he repairs the damage he has caused. At first, the tight-knit community doesn't accept Lightning's bad attitude but he eventually befriends Mater (Larry the Cable Guy) and falls in love with Sally (Bonnie Hunt). However, unable to get the gruff Doc Hudson (Paul Newman) to change his mind about him, Lightning soon learns the inhabitants of the town had a different past that's now painfully absent, and vows to do his best to help them enjoy life once more. In 'Cars 2' (2011) when slow-witted tow truck Mater travels to Tokyo with his superstar friend Lightning McQueen for the international Grand Prix, sleek Aston Martin Finn McMissile (Michael Caine) and his sidekick Holley Shiftwell (Emily Mortimer) become convinced that Mater is, despite his unassuming appearance, nothing less than a brilliant international spy. Finally, in 'Cars 3' (2017), with a new generation of highly-tuned, ultra-fast racers led by seemingly unbeatable rookie Jackson Storm (Armie Hammer) dominating races, legendary speedster Lightning McQueen suddenly finds himself being muscled out of the sport he loves. After then pushing himself to the limit and crashing out of a meet at the Los Angeles International Speedway, Lightning is forced to step away from competing in order to recover from his injuries. However, determined not to give up on his dreams Lightning seeks help from enthusiastic race technician Cruz Ramirez (Cristela Alonzo) in a bid to make it back to the top and defeat his flash new rivals on Piston Cup Racing's biggest stage.